Societies and authorities weave an intricate, complex web. Unwind into what is simple, pure, and unadulterated! [This is a reddish Harvestman. Notice the shadow of the Havestman upon the leaf. Harvestmen are arachnids, but they are not spiders and do not make webs to catch insects. 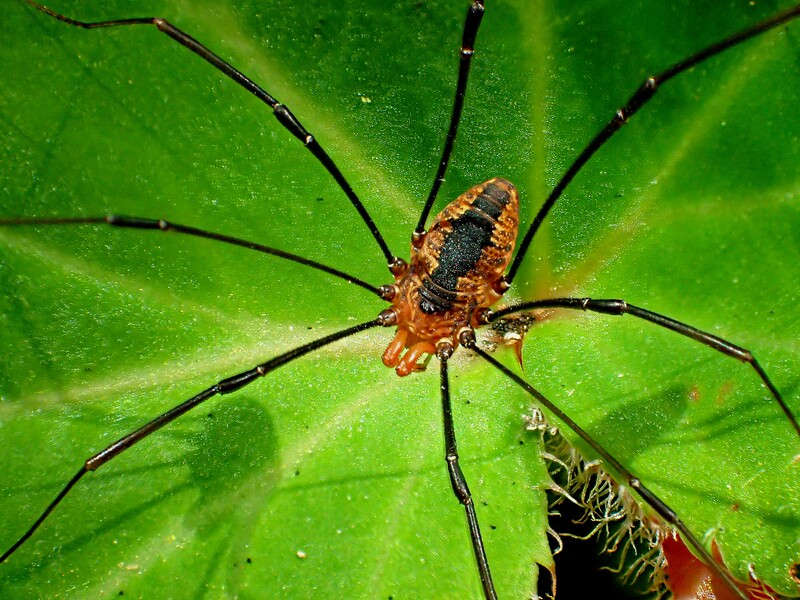 Harvestmen are also called Daddy-long-legs. There are 200 species of Harvestmen in North America… 4,500 to 5,000 worldwide. They are harmless to human beings (and eat many pests, such as flies). I suggested to a lady who was terribly frightened of spiders that she start addressing each one she saw as “Charlotte” (after Charlottes Web) and she says it works….takes the fear away! I’m glad that that works! Any little bit helps! It’s unreal how so many people are conditioned to be full of hatred, fear, and disgust for the poor little creatures! Education (and re-education) is the key. (Steve Irwin was such a master at “re-education”; he had such a contagious passion for all animals that really glowed). I had plenty of tears in my eyes last night, remembering him and his radiant love for the small and the helpless.